Add lori@ncedservices.org to your safe sender list. I have not lacked in hearing fascinating speakers over my career and this one was no exception. Wow, what an amazing opportunity for our STEM Resource Partners this May as they wrapped up the programming in a multi-year project. They were treated to a guest presentation by Dr. Elizabeth Turtle, an associate of the Cassini mission - among others. A relative of one of the lead instructors, when he realized Dr. Turtle's visit because of a MIT speaking engagement would line up with the final session of the year, well, one might say the stars were aligned! It could not have been a more perfect wrap-up to the year themed upon "human exploration of space and the search for life in the universe". As a planetary scientist, Dr. Turtle’s work has focused on using remote sensing observations and numerical geophysical models to study geological structures. She presented fascinating data and images on Saturn’s satellites, most notably of its largest moon, Titan. The teachers also learned about her team’s latest proposal to NASA, Dragonfly. The mission would utilize a drone-like rotor-craft lander to sample and perform various prebiotic organic chemistry and habitability experiments. Front (l-r): Kelly Ruppel - Gorham Middle/High, Leslie Houghton - Lisbon Regional, Dr. Elizabeth Turtle - John Hopkins Applied Physics Laboratory, Sarah Clemmit - Gorham High, Lucie Kinney - Berlin High. 2nd row: Jennifer Downs - Gorham Middle, Amanda Garneau - Whitefield Elementary, Michael Thompson - Haverhill Cooperative Middle, Ann Guilmette - White Mts Regional, Sandy Pouliot - Berlin Middle. 3rd row: Keri Wade - Gorham High, Jennifer Corrigan - Gorham Middle/High, Steve Roberts - Interlakes Middle (instructor), Erv Connary - Whitefield Elementary, Nancy Marchand - Colebrook Elementary. Back row: Caroline Carr - Whitefield Elementary, Bill Church - White Mtn Science, Inc (instructor), Chuck Patterson - White Mts Regional, Kevin Briere - Profile High. Missing: Patti Dugan-Henriksen - Groveton High. 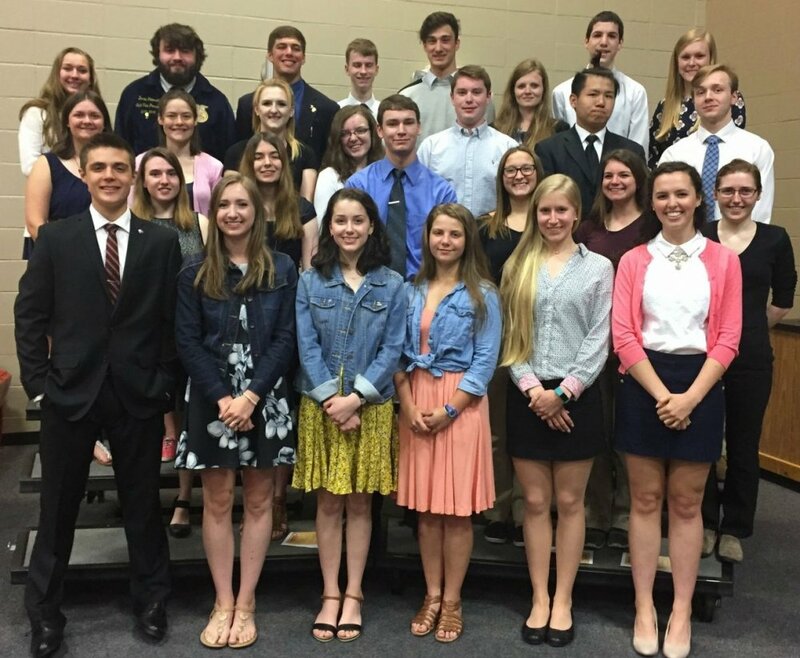 Each spring, NCES and the North Country School Administrators Association recognize outstanding students from the twelve high schools within the North Country. This year's event was held on Wednesday, May 24, 2017. Front: Cole Schoonover – CTE Student of the Year, Mount Washington Valley Career Technical Center; Chelsea Pike - Valedictorian, Gorham High; Autumn Brown - Salutatorian, Gorham High; Rabecca Hucksoll - Salutatorian, Littleton High; India Drummond - Valedictorian, Kennett High; Nina Badger – Salutatorian, Kennett High. Second row: Makaila Weir - Valedictorian, Colebrook Academy; Haley Watson - Valedictorian, Groveton High; Corey Gadwah - Salutatorian, Groveton High; Alexis Owen - Valedictorian, Pittsburg High; Cassidy DeWitt - Salutatorian, Pittsburg High; Sydney Lambert – Salutatorian, Lisbon Regional High. Third row: Audrey Coulombe - Salutatorian, Berlin High; Tiffiney Poirier – CTE Student of the Year, Berlin Regional Career & Technical Center; Brooke Lawson - Salutatorian, Colebrook Academy; Jillian Mason - Salutatorian, Woodsville High; Connor Kerivan - Salutatorian, Profile High; Avery Cheng – Valedictorian, Littleton High; Shayne Hudson – CTE Student of the Year, Hugh J. Gallen Career & Technical Center. Back row: Sierra Lamphere - Salutatorian, White Mountains Regional High; Dustin Peterson – CTE Student of the Year, Arthur T. Paradice Regional Career & Technical Education Center; Jared Cape - Valedictorian, White Mountains Regional High; Vajl Adamkowski - Valedictorian, Woodsville High; Carter Merrill - Valedictorian, Profile High; Brianna Chase - Salutatorian, Lin-Wood High; Daniel O'Connor - Valedictorian, Lin-Wood High; Laura Superchi – Valedictorian, Lisbon Regional High. Missing from photo: Myra Arsenault – Valedictorian, Berlin High. 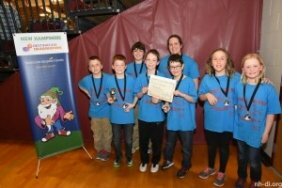 Congratulations to the two North Country teams who traveled to Knoxville, TN to compete in the global finals on May 24th. Edward Fenn School was represented by The 7 Pixel People and Berlin High School by Frankie Manfredi, Kathryn Record, Amanda Shute, Reilly Wood, Tanner Cote and Keenan Wood. Each recipient will receive $10,000 for their extraordinary teaching abilities and commitment to education. Established in 2006, the fellowship program has the dual purpose of retaining good teachers in North Country schools and recognizing excellence in teaching in public schools. 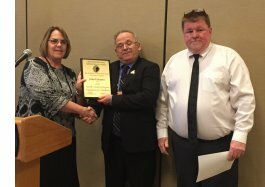 Congratulations to long-time school board member for Colebrook School District, John Falconer, for being this year's recipient of the North Country Champion for Children award. Pictured: Roxanne Wilson, NHSAA Champion for Children Chairperson, John Falconer, and SAU 7 Superintendent Bruce Beasley at the celebration on May 12, 2017 at the Grappone Center in Concord, NH. I wish everyone a relaxing and rejuvenating summer. I hope to see many of you taking advantage of the free professional development we are offering over the next few months. CS4NH is about expanding K12 access to Computer Science education. Computer Science, the study of the principles and use of computers, includes coding and other core concepts. Over 70% of all new STEM jobs are in computing, but only 8% of STEM graduates are in Computer Science. Less than 20% of those graduates are female. With a concerted statewide effort, we can turn these trends around in NH. This summit will feature a keynote speaker followed by break-out sessions, lunch, and panel of experts for various user levels. Educators are encouraged to form strategic district or school team(s). A team may be within a grade group (PK-5, 6-8, 9-12) or span across PK-12. A school team consists of 3-5 school personnel which may include (but is not limited to): teacher, administrator, curriculum coordinator, technology integrator, library/media specialist, etc. Modest stipends are available for presenters and facilitators. If you are interested in delivering a 2.5 hour workshop, preferably hands-on or with some sort of active engagement with participants, please submit a proposed title, brief description, and intended audience to lori@ncedservices.org by June 30, 2017. There will be a limited number one hour breakout sessions in the afternoon. If you are interested in facilitating a breakout session on a specific topic, please contact lori@ncedservices.org. Make Elementary Science Real and FUN! Join us for a 2-day workshop to gain more experience with science activities and field investigations. Our goal is to get you excited to teach science, using NGSS as a guide. You will participate in the process of science by making observations; asking scientific questions; designing and carrying out investigations; analyzing and interpreting data; constructing explanations; and supporting claims with evidence. We will work outside and inside, as we conduct full scientific investigations from “start” to “finish,” and explore the use of Google Sheets and other tools for basic graphing and data analysis. We will provide a variety of approaches and ideas that can be modified for different grade levels in the elementary classroom. Many of the activities featured will provide opportunities for students to deepen their understanding of science concepts as well as develop skills needed to meet CCSS in math and ELA. Past participants of workshops with Jackie and Sarah are welcome to attend. These will be new projects and activities. Register: Online, call NCES between 8-4 M-F at 603-466-5437 or email lisa@ncedservices.org. Please register no later than June 14th. Launch a science experiment to 100,000 feet. During this three day workshop, we will establish the criteria and constraints for a weather balloon science payload. We will then design payload box(s), practice our launch procedures, and practice our radio tracking procedures. Finally, weather permitting, we will launch to the edge of space! Example experiments could include temperature data logging, UV exposure data logging, wind speed, fast plant seed exposure to low temps and high radiation environments. We will deploy at least two camera systems to photograph the entire journey to space and back. Register: Online or call NCES between 8-4 M-F at 603-466-5437 or email lisa@ncedservices.org. 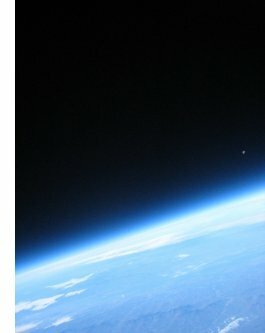 Note: This photo is an image captured from an attitude near 98,000 feet from the Profile High School launch in the fall of 2016. Looking west at the setting moon. Vermont's Green Mountains are visible. Profile's payload box made it to "near space". 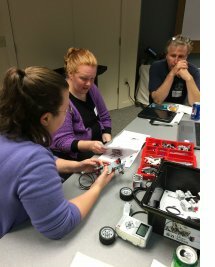 With a history dating back to the mid 1990’s, MINDSTORMS is a well established robotics kits for upper elementary through middle school and beyond. The current version of the MINDSTORMS kit is based on the EV3 programmable brick, a very durable unit with four inputs, four outputs, and plenty of computing power for a very wide range of science and engineering design projects. This workshop will give the participant everything from a “getting started” experience through intermediate topics in programming, structures, and mechanisms. During this skill building two day workshop, you will learn or review the use of STEM construction tools for cutting, drilling, fastening, gluing, soldering, and prototyping a range of STEM builds. 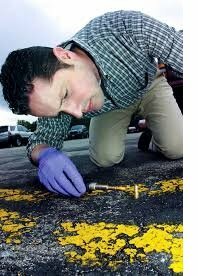 You will also learn strategies for using low and medium risk tools with students (e.g. glue guns, soldering irons, and power tools). Finally, you will put your tool use into practice with fun quick, medium, and large scale projects from scratch such as stomp rockets, hovercrafts (small and human sized), pinewood derby tracks, rumble racer tracks, catapults (small and large), and kiddie pool sized boats and submarines. Spark NH is pleased to extend this invitation to you to a very special opportunity: a 3-Day Institute to become a Community Facilitator of the "Mind in the Making" modules. Thanks to a generous grant from the NH Department of Health and Human Services, Maternal & Child Health Section, Spark NH can offer these Institutes for free! The Institute is free, but there are certain expectations of becoming a Community Facilitator, please see below. 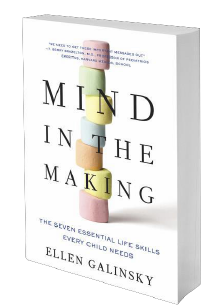 Mind in the Making (MITM) was developed to share the science of how young children learn and it covers the seven essential life skills every child needs. In short, these executive function skills include focus and self-control, perspective taking, communicating, making connections, critical thinking, taking on challenges, and self-directed engaged learning. Included in the Institute will be information on Vroom, a new tool for families and caregivers of young children to turn everyday moments into brain building moments. MITM is the science behind Vroom. The MITM Institute brings together parents, educators, community leaders, and early childhood professionals to learn together about the seven essential life skills and then go out into communities to teach these to others. See the flyer details on the Institute and the overview for more on MITM. For more information or to register, contact smccullough@sparknh.org. The Arts Alliance is planning a series of low-cost professional development workshops for arts specialists as well as classroom and special education teachers in July and August, under its contract with the John F. Kennedy Center for the Performing Arts. Email programs@aannh.org for details. The Alliance will also be hosting end-of-year meetings for arts educators, media specialists, English/LA teachers, and school enrichment program planners and parents' groups in June, including a program preview. The first artist residency of the year will be with children’s writer Alicia Potter (author of the award-winning Miss Hazeltine’s Home for Shy and Fearful Cats and the nonfiction title Jubilee! One Man’s Big, Bold and Very, Very Loud Celebration of Peace). Schools interested in hosting Alicia should contact the Alliance. In October, artists in residence will be acclaimed “Art of the Duo” musicians Kinan Amzeh, a Syrian clarinetist, and Dinuk Wijeratne, a Sri-Lankan born pianist, composer and conductor. Interested middle and high school music and World Studies teachers are invited to contact the Alliance for details. This summer’s White Mountain National Forest Artist in Residence, Steve Wilkes, is a Berklee College of Music professor who will be creating an aural map of the Forest; he is eager to engage educators and students interested in participating in recording and mapping activities. Contact the Arts Alliance for details. High school students wishing to do community service/volunteer work in the arts during the summer are also invited to contact the Alliance. school staff get to know their students and families outside of the classroom. The more teachers connect with the families of their students the better able they are to support students learning and development. Studies show that this program has improved attendance, test scores, classroom behavior, cultural awareness and increased family engagement in schools. Visits last about 40 minutes, and are conducted in partnership with another teacher. During the visit, time is taken to share experiences, expectations, and hopes and dreams. This is not a parent/teacher conference. These are NOT meetings to tell parents what to do or to get them to sign up for anything. Every family is eligible for a home visit: no one is targeted for any reason. 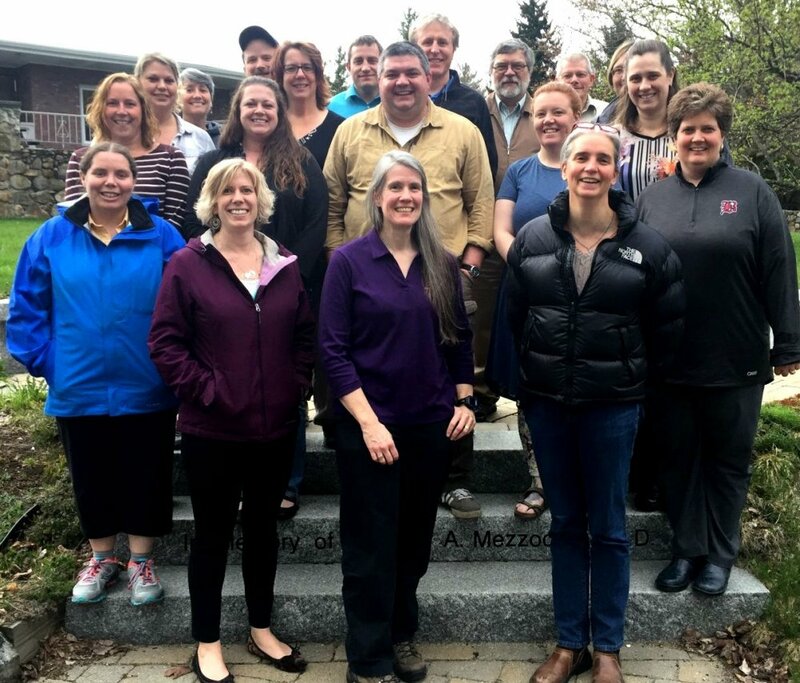 In partnership with the Education Resources Consortium, White Mountains Regional School District is hosting two intense days of provocation and possibilities in projects, inquiry, teamwork and leadership on June 26-27, 2017 at WMRHS. In the traditional “culture of teaching” the educator is primary the actor and the student generally a passive respondent. The times now demand a critical new orientation, an evolution of practice to a “culture of learning”. This conference will engage educators in using problems and projects, infuse technology and inquiry techniques, and develop skills in coaching, connecting, and advising students to push for deeper learning. Increase teacher skills and knowledge base for inquiry learning, animating STEM programming. Identify key elements of teacher support and supervision in a culture of learning. Design high-interest, authentic projects and thematic units to increase student engagement and motivation. Infuse state-of-the-art technology tools and applications to advance student voice and ownership. Create a positive context for professional culture leading to key next steps in school re-design. A few slots remain in latest professional development opportunity through the NCES and WMSI partnership. Many of you may already be engaging with the "Hour of Code" activity through Code.org. The intent of this PD opportunity is to give North Country Code Leaders the skills and curriculum ideas to bring back and teach to their colleagues in order to take the school to the next steps beyond the "hour of code". The purpose of this professional development series is to begin integrating coding literacy in the elementary grades as a key element of developing robust computer science programs K-12. The PD is a "train the code leader" model and focus on curriculum for K-8. Depending on the structure of your school(s)/district, this could involve a high school educator if there is a means for to work on implementation in the earlier grades. Ideally we are seeking two person teams per school to participate. The commitment would be 8 evenings, one a month at NCES beginning in the fall of 2017. Principals should contact NCES to reserve seats for their school participant(s). Registration is first-come, first serve. Share your energy and ideas. Highlight the good things in our region. Act together with your friends and family to make our place as great as it can be. Practice thinking positive and building from strengths. Embrace people who are different from you. 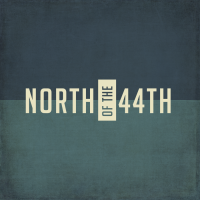 Join the North of the 44th Movement today! Project WILD and Project Learning Tree are international activity-based, supplementary curricula that support the teaching of conservation and environmental education concepts. If you are looking for quick activities to do with your summer or after school program this workshop is for you. We will be doing activities that can be done outside and help reinforce ecological concepts about ecosystems and habitats in a fun way. You will be introduced to a variety of activities as well has have time to practice doing an activity. While this workshop is designed for use in camp, nature center or after school programs it is appropriate also for the classroom teacher. You will receive a copy of each guide. This workshop is being supported by EETAP through a grant from National Project Learning Tree. NHSTE is now accepting nominations for its two prestigious awards that will be presented at the Christa McAuliffe Technology Conference! Nominations will be accepted through October 1, 2017. Please visit the NHSTE website (http://www.nhste.org) for more information or to nominate a colleague today! content and the requirements for various entities in special education. 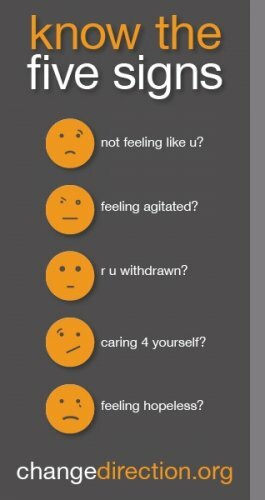 Looking for help with substance abuse or mental illness but don't know where to turn? Interacting with a child from birth to age 5? Vroom turns shared moments into brain building moments. Whether it’s mealtime, bathtime, or anytime in between, there are always ways to nurture children's growing minds. Interested in CS / Coding Meetups? The Office of STEM education is looking to host monthly meetups in Concord with weekly virtual office hours for educators, students, parents, and job-changers interested in learning more about computer science (CS) and coding. Educators can earn CEU’s and start building a portfolio for the new Computer Science educator certification. The Campaign to Change Direction has made the above rack-cards available to all students and teachers in NH schools. For the North Country, these were distributed through the superintendents. Learn more about this campaign to change the culture of mental health in America. 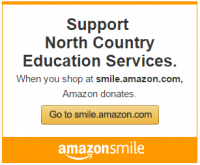 Your tax deductible gift helps support the work of the organization in being a leader in providing professional development and educational services, facilitating partnerships and fostering collaborations that benefit member schools, advocating for resources for teachers and students, and continuously creating opportunities that enhance education in the North Country. NCES is an equal opportunity employer and provider.